February is the month we usually associate with Valentine’s Day and so hearts are on our minds. We see cardboard hearts displayed in store windows, chocolate and cinnamon hearts in candy stores, and Valentine cards sent to and from kids in school. But have you given much thought to the other heart we associate with February? February is Heart Month! Heart and Stroke foundations throughout the world recognize February as Heart month and take the opportunity to draw special awareness to the heart that isn’t cardboard, cinnamon, or chocolate. The one that is in your body, pumping blood to keep you alive. Take care of the most important muscle. The heart is a muscle and like any other muscle, it needs to be strong. Unlike the muscles that attach to our joints and make us move, the heart needs a unique type of physical activity or exercise regimen. We call this cardio activity because it refers to the cardiovascular or circulatory system. It is also known as aerobic activity because it requires the presence of oxygen. By doing cardio or aerobic activity, we make our heart work more efficiently in the transport of oxygen to our entire body. To get the most oxygen circulating through the system, the heart needs to pump harder and faster, which will make it stronger. The activity must involve large muscular movement so that more blood is needed for those working muscles. It needs to be continuous, ideally for 10 minutes or more at a time and it should be done most days of the week. Before I tell you more about the things you can do to make your heart stronger, let’s first review some concepts regarding the cardiovascular system. The cardiovascular system is comprised of the heart (pump) and arteries and veins (the vessels or carriers) which deliver blood with oxygen from the lungs and other nutrients to all the cells of the body. When the heart pumps, there is a detectable rhythm or pulse and this can be measured as a heart rate. Under normal healthy conditions, the heart at rest pumps blood more slowly than during physical activity. There is a wide range of heart rates considered to be normal. Heart rates are normally measured in beats per minute (BPM). Healthy resting heart rates are between 60 and 80 BPM, normally around 70 for males, 75 for females. Each time the heart contracts, blood circulates through the body, being forced through the arteries. This force is known as blood pressure. Normal resting blood pressure is around 120/80 (measured in millimetres of mercury or mm/Hg). The first number represents the pressure when the heart contracts (systolic blood pressure). The second number represents the pressure when the heart relaxes (diastolic blood pressure). During physical activity, as demand for oxygen increases, the heart has to pump faster to provide more oxygen. The amount of blood the heart pumps out in one beat is called the Stroke Volume. The amount of blood the heart pumps out in one minute is called Cardiac Output. Another important concept in understanding the mechanics of the heart and circulatory system is Aerobic Capacity. This is the body’s ability to deliver and use oxygen at the cellular level. Aerobic Capacity is often referred to as VO2 max. The left ventricle of heart increases in wall thickness, which means it can’t pump out oxygen-rich blood to the aorta as efficiently as before. During physical activity, it takes the entire cardiovascular system longer to adapt to increased demands. The heart takes longer to return to its resting heart rate after exercise. The efficiency of oxygen exchange declines by about 1% per year due to decreases in maximum heart rate, total body muscle mass, and the ability of muscles to use available oxygen. The most drastic declines are between ages 65 and 75 and between 75 and 85. Despite changes, heart function in non-diseased individuals remains adequate for resting and light physical activity. However inactivity, smoking, diabetes, and poor eating habits all contribute to an unhealthy heart and increase the risk for heart disease, stroke, and heart attack. As we do more physical activity and exercise, our whole body including our heart gets fitter. Our resting heart rate decreases because the heart becomes stronger, and thus contracts with more force, so not as many beats are necessary to pump the required amount of blood. Also as we get fitter, our resting blood pressure stays pretty constant because exercise helps to maintain the elasticity of the vessels and keeps the circulatory system healthy. So, one might argue that exercise helps combat the effects of ageing and certainly helps reduce the effects of premature ageing resulting from unhealthy lifestyles. So, what can you do for your heart? Moderate activities are what is mostly recommended for older adults. The Heart and Stroke Foundation has a whole host of resources to help you. Please see their website for further details. Especially relevant and current this month is their 2010 Annual Report on Canadians Health, called A Perfect Storm, which was released at the end of January. Between 1994 and 2005, rates of high blood pressure among Canadians young and old skyrocketed by 77%, diabetes by 45% and obesity by 18% – which are all major risk factors for heart disease. Recommendations from the Heart Association include better diet, quitting smoking, limiting alcohol intake, and of course, increasing the amount of physical activity. For those who already have heart disease and other conditions, they suggest the HeartWalk Workout. As with any type of exercise, please consult your health care provider before beginning a program. Start slowly and build up! So, now that it’s February, maybe it’s time to think not only about chocolate, cinnamon, and valentine card hearts but the heart beating inside you. Make this your month to give yourself a valentine’s day present — a more healthy heart! More information on becoming more active can be found in Canada’s Physical Activity Guide for Older Adults. More information on prevention and treatment of heart disease can be found in Heart and Stroke Foundation of Ontario. Researchers at Duke University in North Carolina published results of a two year study of 641 overweight long-term survivors of colorectal, breast, and prostate cancer to determine if tailored telephone counseling and mailed out printed material promoting exercise, healthy diet, and modest weight loss would have a positive effect on the functional outcome of those survivors. The group was split into an intervention group or 319 participants who received the home-based program and a control group of 322 who received the material only after the intervention period of 12 months. The participants ranged in age from 65 to 91 and were recruited from Canada, U.K. and the U.S.
Outcomes were determined from a number of scales including a self-reported Physical Function questionnaire and the Late Life Function and Disability Index (measuring changes in lower body functionality) both of which are scored from 0 to 100. Higher scores on these two scales indicated better functionality. As well, measures of physical activity, body mass index, and overall health-related quality of life were taken. The results of the study showed a slower decline in functionality over the 12 months in the intervention group by more than half (-2.15 compared to -4.84). Although there was only a slight improvement in lower extremity function in the intervention group as a whole (+0.34), there was a marked level of decline in functionality in the control group (-1.89). Physical activity, dietary behaviours, and overall quality of life increased significantly in the intervention group compared with the control group. There was also a marked difference in weight loss on average between the two groups (loss of 2.06 kg in the intervention group vs. 0.92 kg in the control group). This study has shown a reduced rate of decline and improvement in other health markers in a group who received individualized counseling and targeted printed material. Considering that cancer survivors are at a greater risk for subsequent malignancies, other related illnesses, and a higher rate of functional decline than the general population, the results of this study could indeed have a positive impact on this trend. Morey, M.C., Snyder, D.C., Sloane, R.S., et al. (2009). Effects of Home-Based Diet and Exercise on Functional Outcomes Among Older, Overweight Long-term Cancer Survivors. Journal of the American Medical Association, 301 (18), 1883-1891. Tango-dancing: a great way to improve your balance and confidence in walking. Olé! The study at McGill University in Montreal randomly assigned 30 people aged 62 to 69 into two groups, all of whom had previously fallen and were at risk of falling again. One group underwent a 10-week walking program and the other took tango-dancing lessons for the same period of time. After completing their respective programs, the participants were assessed using an Activities-based Balance Confidence (ABC) scale, sit-to-stand test, and had their normal and fast walking speeds recorded to determine if improvements were made in their balance and walking confidence and which of the two programs was most effective. Participants in both groups made improvements in all tests after the 10-week programs were finished and continued to maintain their improvements at the 1-month follow-up. However, greater gains were made in sit-to-stand speed (a measure of lower body strength) in the tango group. This also occurred in the results on the ABC scale. Normal and fast walking speeds improved for both groups where the improvement was about the same after the 10-week period but that benefit was slightly higher for the tango group when the participants were tested at the 1-month follow-up. The researchers could not assume, however, that the improvements in balance and confidence in the walking group would necessarily translate to lower risk of falling because their baseline scores were already higher than the cut-off point set for improvements to fall risk. Still the researchers felt that adding tango classes to an arsenal of physical activity programs designed to improve balance and walking confidence was a good way to help reduce the risk of falls in older adults since the seniors who participated in the study continued to take the classes after the follow-up period. The classes were clearly popular with the participants. McKinley, P., Jacobson, A., Leroux, A., et al. (2008). Effect of a Community-Based Argentine Tango Dance Program on Functional Balance and Confidence in Older Adults. Journal of Aging and Physical Activity, 16(4), 435-453. Happy New Year! Treat Yourself to a Movie! My clients and friends often ask me how they can stay motivated to exercise regularly at home. Let’s face it, walking or running on a treadmill, using an elliptical or cross-trainer, or riding a stationary bike can be just plain boring! Boring or not, aerobic activities like these are a great way to improve your cardio fitness, which is crucial to your overall health. In the winter time, especially, it is hard to get this level of fitness any other way, unless you have access to an indoor pool, cross-country ski trails close by, or are lucky enough to be living in warmer climes! If you don’t belong to a gym or fitness facility, I highly recommend finding a piece of cardio equipment that you can afford and fit into your home. Remember, your best buys are now! Most fitness equipment stores and other retailers are offering deep discounts on new and used equipment. But once you acquire a treadmill, elliptical trainer, rowing machine, or some other piece of cardio equipment, how do you spend the 20 or 30 minutes per day of moderate intensity required to stay fit without getting bored, giving up, and then using that piece of equipment as an expensive coat hanger? While some of my clients get through their workouts just by listening to music, I have found (both professionally and personally) that putting a television in front of the cardio equipment can be a highly effective motivator. But what I have found most effective has been watching not just a TV show but 20-30 minutes of a movie — preferably one that keeps you riveted. So, if you can fit a VCR or DVD player on that same shelf beside your TV, put on a movie, and work out for a pre-determined time period. But here’s the clincher: decide how long you will work out before you get on your machine. When that time period has passed, get off the machine, whether or not you are at a “good spot” in the movie. 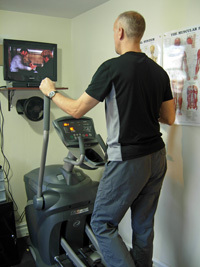 Stopping the tape or DVD when the action is heated or the plot is thick will ensure that you get back on the machine the next day to pick up where you left off. For instance, I recently watched a suspense movie with a running time of about 100 minutes. For 4 days in a row, I watched the movie, without any skipped days for exactly 25 minutes each day (OK, one day I just COULDN’T stop the movie until 30 minutes, honest I couldn’t!). And my other piece of advice to ensure your success at sticking with your exercise program is to make sure you ONLY watch that show while you are doing your cardio routine. No popping the tape out and watching more later while sitting on the couch! Make the commitment that the movie you pick is for your cardio routine only. If you’re like me, you won’t want to miss any of the action so you won’t miss a day of exercise. Good luck and happy watching… I mean exercising! Spring is Here. Get Outside! For many older adults, spring means two things: Golf and Gardening! Over the winter months, you may have been quite inactive and remained indoors and out of the cold. Now that spring is here, the days are getting longer and warmer, it’s time to get outside, whether that is on the golf course or in the garden. Both these activities will help you stay fit. But before you hit the golf course or start crouching in the garden, you should prepare. Both activities use muscles that may have become weak over the long winter. You’ll want to enjoy your first day on the green or in the green without feeling sore afterwards. Here are some exercises you can do now to prepare. Secure a resistance band to a stationary object at shoulder level. Stand with feet hip-width apart in golf stance, holding onto the other end of band in the “take-back” position. From here, inhale and as you exhale, pull your hands against the band’s resistance to the “contact” position, as if striking the ball. Inhale as you slowly return. Perform 10-15 of these using a light or medium resistance band, at least 5 feet long. Stand on the middle of a long resistance band (8 feet) and hold ends together with both hands. Inhale and as you exhale, go into the “take-back” position with feet wide apart and band stretched between them. With the hands back in the “take-back” position against resistance, the band should look like a right-angle triangle. Perform 10-15 of these with light to medium resistance. These can be done against a wall, with or without a ball, or as free squats, using dumbbells for resistance. Stand with back against the wall. If your wall is rough (e.g. flat paint), you may want to use a small (8 inch) ball placed between your back and the wall, just above the buttocks. Step out about 1 1/2 times the length of your feet and stand with feet shoulder-width apart. Inhale as you slide down the wall, keep your back against the wall or straight up and down if using a ball. Stop when your thighs are at right angles to your calves or sooner if you have any knee pain. Ensure that your knees do not go past your toes. Keep your weight on the heels. Exhale and straighten back up, pushing your buttocks and knees back towards the wall. Do 8-12 or until you begin to feel a “burning” or fatigue in the front of thighs. These can be done with dumbbells or a resistance band. Sit with the right forearm crossed over the right thigh, wrist unsupported by knee or thigh. Hold a light dumbbell in the hand with palm facing upward or secure a resistance band around the hand, ends held taut under the foot. Inhale as you lower the wrist towards the floor, exhale as you curl it upward, bending the wrist upward, to exercise the wrist flexors. Do 10-15 repetitions with light to medium resistance, then switch sides. Perform the same exercise but with the arm rotated so that palm is facing downward to strengthen the wrist extensors. Stand with arms down at your side, holding one end of a resistance band or tubing in your hand. Secure the other end of the band across your body to a stationary object at waist level. Keep elbow of exercising arm at your side but bent at 90 degrees, palm facing up, forearm parallel to floor but pressed against your stomach. Inhale and as you exhale, externally rotate the shoulder, moving the hand in an arc motion from against your stomach to a position out from the body, forearm still parallel to the floor (thus away from the resistance). Do 10-15 repetitions with light resistance. Stand holding the band in one hand with upper arm against your side, elbow bent at 90 degrees, forearm externally rotated out past your side at waist level, palm facing up. Secure the other end of the band beyond the side of the exercising arm so that it is taut. Inhale and as you exhale, internally rotate the shoulder so that forearm moves in an arc away from the resistance and toward your body, ending with forearm pressed across your stomach. Stand sideways to a chair or other stationary object, holding onto it with the inside hand. Bend knee of outside leg to 90 degrees. Internally and externally rotate the hip so that the thigh, which is parallel to floor, moves in an arc fashion with foot coming close to the wall and then outward away from wall. For more resistance, use an 2-3 lb. ankle weight or secure a resistance band away from your body for internal rotation and by the wall for external rotation. Golfers should make sure they stretch the muscles they used for the resistance exercises or after they’ve gone out for a round of golf. It is particularly important to stretch the mid back area since it is most used in the golf swing. A good mid-back stretch is to stand with feet shoulder-width apart, hands together in front and fingers interlaced. Bend slightly at the knees. Inhale and as you exhale, turn palms outward and extend arms out in front. Hold the stretch for 15-20 seconds but keep breathing. Keep your head bowed, with chin tucked back so as not to strain the neck. I also recommend doing a thigh stretch, followed by hamstring and buttock stretches to stretch out the muscles strengthened by the squats exercise. To stretch the front of thigh, stand and bend right knee. Holding onto a stationary object with your left hand, reach your right hand around to hold onto your right calf, ankle, or pant leg. Point the right knee toward the floor, while keeping the two knees in line with each other. Stand up straight throughout the stretch and hold for 15-20 seconds. Remember to breathe throughout the stretch. Switch sides and repeat on other side. To stretch the back of thigh (hamstrings) and the buttocks muscles, lay down on the floor on your back, preferably on a soft mat and cross the left leg over the right thigh. Loop the left hand between the thighs, loop the right hand around the right thigh and clasp the hands together, bringing the thighs up to the chest. To stretch the hamstrings, keep the uncrossed leg straight, while holding the thighs toward the chest. To stretch opposite buttocks muscle, bend the knee of the uncrossed leg so that it is at 90 degrees. Hold both stretches for 15-20 seconds. Repeat on other side. Remember to breathe throughout the stretch. Exercises that will help prepare you for gardening are those which target the mid-back, biceps, and triceps for the lifting, carrying, and digging and the thighs and buttocks for kneeling and crouching. 1. Squats See the description above for this exercise. Sit at the edge of a chair, knees slightly bent, heels touching floor and toes pointed up so that the thighs are a little lower than the hips. Place a resistance band across the bottom of both feet, toward the tops of the feet and hold an end in each hand. Sit up straight, hold the band taut. Inhale and as you exhale, pull the ends of the band along your thighs from the knees toward the hips by squeezing the shoulder blades together. Do this slowly to a count of 3. Do not lean back or shrug your shoulders. Inhale as you return to starting position. Do this slowly to a count of 3. Do 10-15 of these with medium of resistance. Grip the middle of a medium resistance band with your left hand, leaving both ends dangling. Make a fist with this hand and hold it against the middle of the top of your chest, flipping the top part of the band over your shoulder. Grip the lower half of the band with your right hand, about 4 to 6 inches below the right fist. Hold your right hand out from your stomach. Check that both your upper arms are held diagonally out from your sides and elbows bent at 90 degrees. With your left hand stable, inhale first, then exhale while moving your right hand downward and outward in an arc motion toward your right hip (count of 3). Finish with your right arm fully extended and hand held out from your right thigh. Slowly return your right hand to the starting position as you inhale (count of 3). Repeat 8-10 times then switch to right hand at chest and right hand below. Stand on the middle of a resistance band (at least 6 feet length). Gather one end of the band in each hand, holding it taut with arms against side of your body, palms facing forward. Keeping your elbow pressed against your side, bend your elbows and bring your hands about 3/4 of the way to your shoulders, while exhaling (count of 4). Slowly lower your arms to starting position, while inhaling (count of 4). Do 8-12 repetitions using medium resistance. Stretch the muscles that you worked during the resistance exercises and also stretch the back of the calves. I also recommend doing a course of stretching after you have been out working in the garden. To stretch out your biceps and triceps, stand with arms behind your back and fingers interlaced. Extend your arms up and out away from your body, while keeping the head down. To stretch the back of calves, stand up straight with one foot out in front, the other behind, in a long stride. Put a bend in the front knee and reach your arms in front, preferably against a wall or stationary object. Lean into the stretch, trying to keep your back heel on the floor. After about 15 seconds, put a slight bend in the back knee, while still keeping the foot on the floor. Hold for an additional 10 seconds and switch sides. Always breathe during your stretches. Enjoy your spring, whether you’re on the green with your golf clubs or in the back yard with your green thumb! I’m a youthful, energetic senior – 66 years of age. I certainly enjoy your articles and responses. I love to jog, walk and am an avid gardener. Lately, however, I have developed “water on the knee”. It sure is curtailing the above activities. My doctor has advised “wrapping it”, applying ice, and I take anti-inflammatories when it is really bothering me. X-rays were done and no arthritis is present. I realize positions and activities which place pressure on the knee joint should be avoided. I cannot recall any trauma to the knee-maybe the repetitious “up and down” motion involved in gardening is the culprit. Can you suggest some activities or exercises that may be helpful with this problem ? My doctor tells me there is no quick fix and no doubt she is right. Come spring, would love to be able to continue with my gardening hobby. Can you offer some feedback on this problem? Thanks in advance. Sorry to hear about your “water on the knee”. It’s good that no arthritis is present as that can often be the case. “Water on the knee” is a phrase applied to a whole host of conditions which cause fluid build-up and inflammation around the knee joint. As a term, it is only descriptive and does not tell you the cause, much like saying you have “dermatitis” or “inflammation of the skin”. The question then is what caused the condition? The answer to the question will not only help you treat it but will also help you know what to do to avoid it in the future. Your doctor has given you good advice about wrapping and icing the joint. You may also try elevating it when there is new inflammation present. Following the RICE principle (Rest, Ice, Compression, and Elevation) will help reduce inflammation. As to the cause of the condition, you may have torn one of the menisci in the knee or damaged a ligament. Also there can be inflammation of the busa (bursitis) which can also cause fluid to build up around the knee. Since you don’t recall having injured the knee, it may be more of a “wear and tear” problem, perhaps from gardening or quite possibly jogging. Does jogging irritate your knees at this point? The pounding of the foot onto the pavement, especially if you do not have supportive footwear or have weak ankles, can cause a ripple effect up through the shin and into the knee. It’s something you might want to think about. It may be time to give the jogging a break and try something with lower impact such as using an elliptical trainer or recumbent bike. Another good aerobic exercise which is very forgiving on the joints is aqua-fit. I suggest that you consider visiting a sports medicine clinic. Your insurance may cover this if you have a referral from your family doctor. Either way, it’s good to keep your doctor informed. A sports medicine clinic will have practitioners such as physiotherapists who may be able to help you determine what has caused the condition and more importantly what you can do to avoid a recurrence. They will be able to prescribe specific exercises you can do that involve stretching to increase mobility about the joint and resistance exercises which will increase the muscular strength supporting the joint, for example the thigh and calf muscles. It is important to progress slowly. Employing light resistance with bands or tubing is a good idea but a good sports medicine clinic should be able to prescribe a set of exercises you can follow. Your doctor may suggest having the knee drained or other surgeries, which can bring relief. The main thing is that if you choose to have the area drained of the fluid, get to the root of the problem so that you won’t just get a recurrence afterwards. Where there is inflammation, there is protection from stress and strain. You will want to find the source of that stress and strain, try to eliminate it or mitigate it, and develop a strategy to support your joint for the future. Talk to your doctor again or see a physiotherapist and tell him or her that you want to continue being active but want to find out how to treat the area effectively and keep it from coming back. Good luck and let me know how you’re progressing. What are your resolutions for 2007? How many have you kept or broken? More importantly, are your resolutions backed up with goals and a plan to reach those goals? Perhaps one of your resolutions is to get in shape. Perhaps you’ve thought of joining a fitness club. If your mailbox is like mine, it has been flooded in the last couple of weeks with gym membership deals-offering 2 for 1, 1st month free, no administration fee and many other tempting reasons to join. Fitness Clubs offer these deals because they know that people make New Year’s resolutions about getting in shape. And fitness centres bank on the fact that when they have a flurry of new member sign-ups, their space won’t be overcrowded for long. The majority of new members will only attend the first month regularly and then will only make an occasional appearance, if any, for the rest of the year. Like not attending the gym we’ve just joined, our resolutions are often broken within the first month. Why is it that so many of us make resolutions we fail to keep? Is it that we are weak-willed or want to set ourselves up for a fall? Or is it that we have good intentions but lack the tools to fulfill those intentions? I believe that for many of us, it is the latter. We want to lose weight, eat better, become stronger, increase our stamina, and a whole host of other things but we just don’t know how to do it. Sure, we take the first steps by going on a diet, throwing away the pack of smokes, start walking, and joining a gym but we have no real plan because we have no specific goal. We say things like “I want to lose weight” or “I want to get in shape” but we don’t specify what exactly that means and how we will reach that goal. If our goal isn’t specific, our steps to reach that goal won’t be either. And without specific steps, we’ll just be walking aimlessly. Make sure your goals are specific so that you can plan for and carry out the necessary steps to reach them. Rather than just saying you want to be fitter or be stronger, formulate your goals around functions and activities of daily living. For example, “I want to be able to get up from a chair without anyone’s help”. In order to realize this goal, you will need to exercise the specific muscles involved in that activity, namely the front of thigh or quadriceps muscles. Specific exercises to strengthen the quadriceps include wall squats and leg (knee) extensions. As those muscles get stronger, they will help you function easier. Functional strength can be greatly improved, even in older age. As you impose specific demands on the body, it will adapt in direct response to those demands. This is the SAID principle which stands for Specific Adaptations to Imposed Demands. Goals set at the outset of your program must be measurable. If you don’t include measurements in your plan, you’ll have no way to gauge your progress. I recommend using specific measurements such as number of sets, repetitions, and weight (or resistance) to log your progress. Using the example of strengthening the thigh, let’s say you define your goal as 2 sets of 8-12 repetitions of 50 lb. on the leg extension machine. As you increase from 8 to 12 repetitions and beyond, you’ll want to revise that goal to a higher intensity, such as increasing the resistance to 55 or 60 lb. You will undoubtedly see that the number of repetitions you can perform will drop back at first but this is OK. You have now imposed a higher demand on your muscles. Soon, you will see that you can do more and will have to increase the intensity level once again. However, the most important measurement you will have of your progress will be that you can now get up from a chair without assistance. Make sure that the goals you set can be attained. Being able to get up from a chair with without assistance is an attainable goal if you’ve previously been inactive, your muscles are weak, and your joints have been taking all of the load. Being able to get up from a chair without assistance if your legs are paralyzed from a spinal cord injury may not be. Talk to your doctor first about your the feasibility of your fitness goals and then talk to a personal trainer who works with older adults to design a program to get you to realize those goals. Prioritize your goals and set markers to know when they’ve been attained so you can gauge your progress. You should expect improvement over time as long as you challenge yourself. Remember the SAID principle! Along with being attainable, goals and expectations must be realistic. If you’ve never gone mountain climbing before, don’t attempt Mount Everest! Despite commonly held beliefs to the contrary, older adults can progress their training of the cardio-respiratory (heart and lungs) and muscular systems at the same rate as younger individuals, although they may need to start at a lower level than someone younger and account for weaker bones and joints if they’ve been inactive. Part of being realistic in your goal setting is to look at your current level of health. If you suffer from illnesses such as coronary heart disease, emphysema, or osteoarthritis, then keep in mind that you will need to progress more slowly than a peer without any chronic conditions. Set your goals within a specific time frame. Exercise goals which stand to be most attainable are those which are set within a period of no more than three months at a time based on 3 days/week for muscle conditioning and 5 days/week for cardio-respiratory, flexibility, and balance. Especially if you are new to regular exercise, the first month or so will be a period of “waking up” the body to exercise. You may not see much gain during this period but you should notice an increase in stamina. Provided you stick with your plan, you should notice that it becomes easier to get through your program. In the remaining 2-3 months, you should notice that you are adapting to those new demands – you will be able to do more and you will benefit from the fruits of your labour. Getting up from that chair will be easier and you will be spurred on to set higher goals for yourself. So this year, make your resolutions count. Be Specific. Set your goals with a plan in mind. Talk to a personal trainer if you need some motivation and guidance. Be good to yourself. Make this year your year to get fit and remember to be SMART with your goals. I am a 69-year young lady who has gone to pot! I am booked for double knee replacement in March 2007. Please advise what core and quad strenghthening exercises I can do to help with my surgery and my overall health. You are doing the right thing in planning for your surgery now by performing strengthening and flexibility exercises. The stronger you are when you go into surgery, the faster you will recover. The surgeon will most likely recommend a course of physiotherapy. Once this rehab program is finished, you should get right back into a regular exercise routine. So, before surgery I would suggest you strengthen the muscles surrounding your knees (quadriceps, as you mentioned) and also the back of thigh (“hamstrings”), as well as both the front and back of calf. I’ve listed common exercises (with alternate names in brackets) for each muscle group. 1. Quadriceps: Knee (or Leg) extension exercises. 2. Hamstrings: Knee (or Leg) curls. 3. Front of calf: Toe Lifts (or dorsi-flexion). 4. Back of calf: Heel raises (or plantar flexion). I suggest you use resistance bands or tubing for these exercises unless you have access to a leg curl/leg extension machine to do exercises 1 and 2. Regardless I suggest you choose enough weight (or resistance) that you fatigue the muscle after 15 – 20 repetitions. This means choosing a lower weight or resistance level than you would for muscle building. Depending on your current fitness level and the extent of arthritis in your knees, you may be able to start with a blue band but more likely a green or red(lighter resistance) one, assuming you are using Theraband brand. If you purchase this brand of tubing or bands, they often have exercise brochures at the place of purchase. Alternatively, there are good exercises on their website. They even haveexercises specifically for knee osteoarthritis. Be sure to follow these exercises with stretching. I would suggest you perform the stretches every day, not just on your muscle strengthening days. Be sure to stretch the area for at least 20 seconds. Go into the stretch until you feel a tug or some tension but no pain. Hold the stretch but continue to breathe. You also mentioned core work. Choosing the most effective core exercises will depend on whether or not you can get up and down from the floor. Many traditional abdominal and lower back strengthening exercises can be done on a chair. Since I don’t know your situation, I cannot safely recommend the best ones to do.